With an average temperature of 70 degrees, San Diego is a perfect city to bike to work. For several years, cycling has steadily risen as a viable mode of transportation. Not only does cycling provide you with health benefits, but it also helps cut down on your carbon footprint. City planners around the world are incorporating more bike lanes around densely populated areas to cut down on traffic congestion, carbon emissions, and to improve the overall quality of life in their communities. 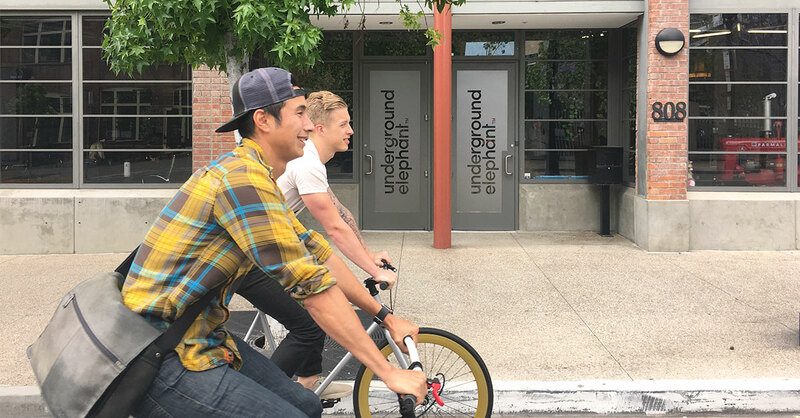 May is Bike to Work month, and with 610 miles of bike paths, San Diego is the perfect city to incorporate a bike ride to your commuting options. If it’s been awhile since the last time you’ve ridden your Schwinn, then we have some tips to get you back on the saddle and ride to work. You don’t want to find out your brakes don’t work on your ride to the office. Make sure you have the proper air pressure, working brakes, and a well-oiled chain. If you don’t have the tools or don’t have the know-how then taking your bike to a local bike shop for a tune-up is a great option. There they can teach you what to look for and show you the proper way to maintain your bike. Don’t get lost on the day you ride to work. Make sure you plan your route ahead of time. iCommute has a trip planner to help you see all of your commuting options including bike routes, public transportation, and vehicle routes. Ride the route on the weekend to check how long the ride will take and leave a little earlier on the day of your commute. Every rider can tell you a flat is bound to happen. Plan to bring a patch, tube, and a small pump, therefore you can avoid having to walk your bike to the office. It’s smart to invest in a couple of small tools to help with any other possible breakdowns. No one wants to perspire through their clothes before they get to work. Wear a t-shirt and pack up your office shirt in a backpack. You can always change into a clean shirt at work. With the right backpack, you can bring an extra comb and hair product to remove the helmet hair. Always wear a helmet. Biking to work is great for your health, but accidents happen, and a properly fitting helmet saves lives. No one expects to get in an accident, but if one does happen, you’ll be thankful for wearing a helmet. Biking to work a couple of times a month can be an awesome way to experience the city we live in and following these tips can ensure a fun and safe ride throughout the year. Take your marketing and sales to the next level. We have the solutions for your customer acquisition needs.